Competition: Win A Copy Of The Haynes Zombie Survival Manual! If this crazy year has taught us anything, it’s that the likelihood of a zombie apocalypse is probably not as far fetched as we think. Hey, if a reality tv star can become president, all bets are off! In the event of your friends inviting you round for brrrainnnsss rather than a quick cup of tea, it might be useful to have some sort of guide to help you navigate this precarious social situation. 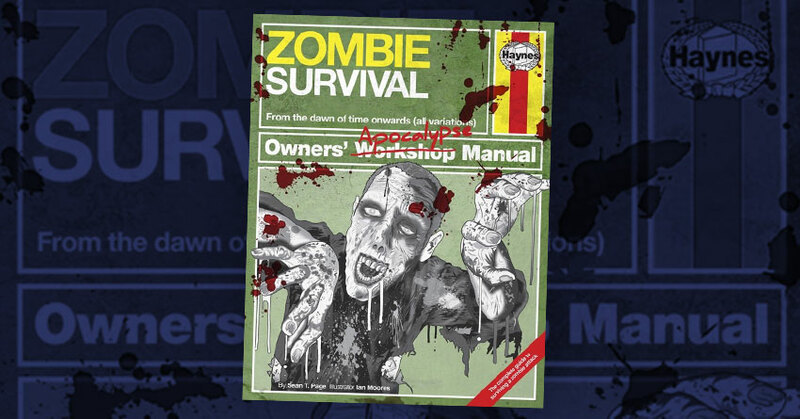 Luckily the nice folk at Haynes have produced the ‘Zombie Survival Owners Apocalypse Manual‘. A handy guide on what to do if confronted by the undead, and how to flourish in a post-apocalyptic world. Accompanied by illustrations, maps, diagrams and step-by-step instructions, the manual is essential reading for those interested in protecting themselves, their families and society at large from the living dead. For iPhone users, there’s also an app version of the book which you can download for FREE from the iTunes store. For more info, visit www.zombiesurvivalapp.com. You can just say you want to win, or… be a bit more creative with your answer, and tell me why I should pick you to win! ? I’d love to win because you never know when you’ll need to survive a zombie apocalypse. I’d love to win this for my friends apocalypse mad son! my brother would love it. i know the apocalypse is coming – i NEED to be prepared. i love zombie films and tv shows…. i am scared witless of zombies! i always joke that in a zombie apocalypse i will be the first to die cos i will just curl up and cry! i need help to give me the skills….. for the day it all hits the fan!! I want to win this for my husband. He was a Zombie Jesus on the Zombie Walk in Brighton a few years ago, but now he’s shaved his head and can no longer do this. I have a feeling I’m going to need this soon. I’ve just gain a teenage daughter and, in only a couple of years, will gain a teenage son. I’ve already noticed signs of zombie-like behaviour from both of them – emitting odd moans and groans when told to get up or do a chore. Surely the next stage is them staggering around moaning? Please let me win this guide so I know what to do! I just wont get around to buying a copy myself, it will sit on the to-do list forever. Then, the zombies will come and we’re not in an “Amazon Now” area. 24 hour delivery is all well and good, but how will that help me when I’m hiding in the loft with the dog and armed with nothing but Christmas decorations and a blunt tile saw? My daughter a huge fan on the Walking Dead would say needs this book, I have bought her a zombie survival pack – I didn’t know such a book existed! Great. Everything about zombies in one book to supplement my braaaaiiiiinnssss…..
My geek son (at Uni) would love this.